a seasoned Nigerian singer,songwriter,performer and actress. She is one of the most popular artists in Africa,infact she is regarded as the Beyoncé of African music. 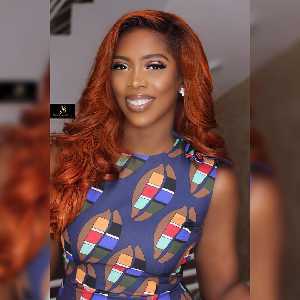 This post contains information and some quick facts about the biography of Tiwa Savage,her wedding,marriage,husband,songs and some other quick facts that you never knew about the Diva. 1. Tiwa Savage was born On the 5th of February 1980 in Ikeja,the capital of Lagos State Nigeria. 2. She currently has a songwriting deal with Sony/ATV Music Publishing. 3. Apart from her valid Sony deal she also has a recording contract with Mavin Records,a deal she signed way back in 2012. 4. Tiwa also signed a management and publishing deal with Roc Nation in June 2016,she confirmed this via her verified Instagram page. 5. Apart from being a singer,she is also a talented songwriter. 6. Tiwa Savage's first album titled ''Once Upon a Time'' was released on 3 July 2013.The album had some hot tracks like "Kele Kele Love", "Love Me (3x)", "Without My Heart", "Ife Wa Gbona", "Folarin", "Olorun Mi" and "Eminado"
7. On 19 December 2015,she released her second album titled R.E.D,that featured songs like "My Darlin'", "African Waist" and "If I Start To Talk''. 8. Tiwa savage sings in English and Yoruba. 9. Tiwa has won one MTV Africa Music Award, two The Headies Awards, one Channel O Music Video Award, one Nigeria Music Video Award, and two City People Entertainment Awards. 10. Tiwa Savage's Alma mater includes the University of Kent and the Berklee College of Music. 11. Tiwa savage hails Isale Eko,Lagos Island of Lagos State Nigeria. 12. Tiwa Savage got married to Tunji Balogun popularly known as Tee Billz in 2013 and currently has one son. 14. Her Genres of music is Afropop,R&B and soul music. 15. She has been in the game since 1996 till now. 16. Tiwa Savage relocated with her parents when she was 11 years old. 17. Tiwa grew up playing trombone for high school's orchestra band. 18. After bagging a University degree in Business administration from the University of Kent, Tiwa secured a job at The Royal Bank of Scotland. 21.Tiwa enrolled at Berklee College of Music and graduated with a degree in professional music at the age of 27. 22. In a session Tiwa disclosed that her business background helped her to understand the intricacies of the Nigerian music industry, this helped her not to be susceptible to deception. 23. When Tiwa was still studying at the at Berklee College of Music she participated in the UK edition of The X Factor in 2006 and advanced to the final 24. 24. Some songs written by Tiwa Savage for some International stars include Monica "Catch Me",Jaicko's "Oh Yeah" featuring Snoop Dogg, and Kat Deluna's "Push Push" featuring Akon and David Guetta. 25. Tiwa Savage's Grammy nomination in 2010 came as a result of a collaboration with Fantasia on the song "Collard Greens & Cornbread". 26. Tiwa Savage's first time on a movie set was with Joke Silva and Ireti Doyle in the stage adaptation of For Coloured Girls. 27. Tiwa savage is the first African female artist to sign an endorsement deal with Pepsi. 28. Tiwa Savage also has her own record label name 323 Entertainment,which she established with her husband Tunji "Tee Billz" Balogun. 29. Tiwa's third album was released in 2013,and was named ''Once Upon a Time''.According to her she wanted to portray the positive stories about her life and also to motivate other upcoming artists by telling them that, once upon a time, she was a little girl in Isale Eko who dreamt of being a star. 30. Tiwa has helped to raise money to help build Schools in her hometown. 31. Tiwa's endorsement deals include Forte Oil,Maggi,and a ₦30 million naira MTN Nigeria deal. 32. According to Tiwa she was discouraged when she decided to step into the Nigerian music industry scene, many people told her that she will not make it,all that changed however when she dropped her debut single titled single "Kele Kele Love",the song became a chart topper in several Nigerian music charts. 33. Tiwa Savage got married is to Tunji "Tee Billz" Balogun in 2013,she held her traditional marriage at the Ark in Lekki and the white wedding was held in Armani Hotel in Dubai in 2014. 34. Tiwas savage's husband accused her of Infidelity on social media on the 28 April 2016,He also accused Tiwa Savage's mother of witchcraft.